Among the voluminous documents that were part of the Atlantic Yards master closing, first made available today, is a mortgage agreement by the Empire State Development Corporation, as mortgagor, to the city of New York, as mortgagee. 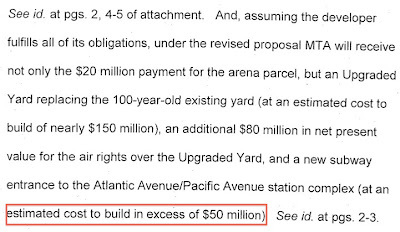 The agreement casts significant doubt on claims in court by the Metropolitan Transportation Authority (MTA) that new subway entrance connecting to the Atlantic Yards arena block is would cost $50 million to build, since it requires the Atlantic Yards developer to pay only $28 million for both the subway entrance and the reconstruction of the Carlton Avenue Bridge. Alternatively, it suggests that, if the developer walks away, the promised new subway entrance and bridge reconstruction would cost significant additional amounts of public funds. 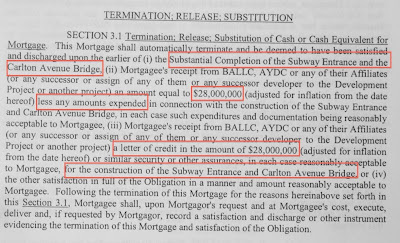 In recent litigation, an affidavit (excerpted below; click on graphics to enlarge) by then-MTA Chief Financial Officer Gary Dellaverson and an MTA Memorandum of Law both insisted that the new subway entrance would cost $50 million. other satisfaction "reasonably acceptable to Mortgagee"
If $28 million can cover the cost of those improvements, what was the basis for the MTA's claims in the lawsuit? If the city would get only $28 million to cover those improvements, and thus would have to kick in another $30+ million for a new subway entrance and reconstructed Carlton Avenue Bridge, wouldn't Forest City Ratner and affiliates be getting off the hook pretty easily?